After bottoming out at .9200 in mid-February the Swissie has declined by 500 pips against the buck -- a stealth rally that has been hardly noticed. Although the franc remains the beneficiary of risk aversion flows, the move into the pair is becoming less frequent as the world adjusts to Trumps mad-dog tweets and realizes that most of them are bark not bite. On the flip side, any further growth in NFPs should assure yet another rate hike by the Fed further blowing out the spread to +2.75% to the dollar and making the short carry ever more painful. 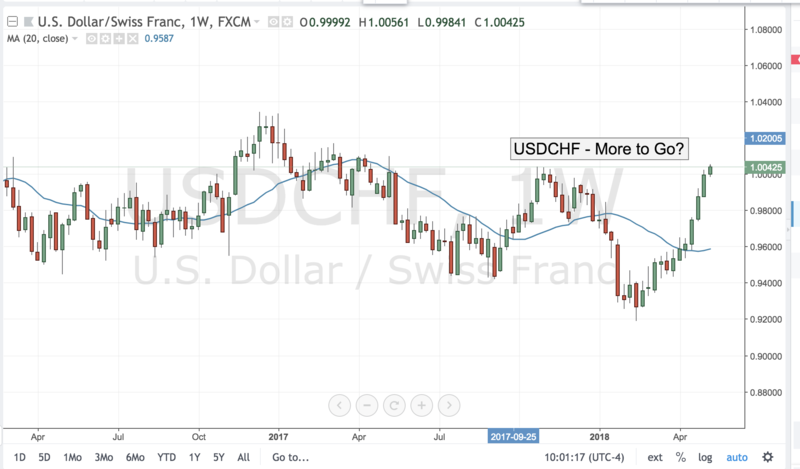 All of this suggests that barring any blow up in geopolitical risk or massive miss on the economic front, USDCHF should continue to crawl towards the .9700 figure over the near-term horizon.